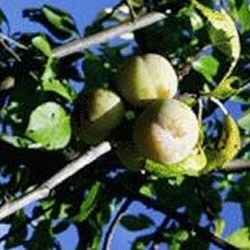 Our bare root Oullins Golden Gage tree is a self fertile Gage that produces large fruits. Large as in when compared to other Gages, not large so that little old ladies cannot lift them (we do get asked questions like this!). The juice content is not as high when compared to other Gages so long term storage in your refrigerator is a good idea and also good for bottling. The Gage fruit colour could be described as sunshine rays bouncing off a golden field of honey coloured wheat with fiery leopard speckling, however that would be more for the metrosexuals and interior designers. For the normals out there, they are yellow with red spots . You should expect a good crop of Gages so long as we don't have too many summers like those of 2012. Saying that, compared to other Gages, the Oullins fares well with poor weather. The Oullins Gage is considered a vigorous tree which means that it will grow faster than a semi-vigorous tree (makes sense to us!) Don't ask us how much they grow per year, this all depends on weather, soil and if you have vindictive neighbours with pruning shears that come out at night. In short, they will not take over your garden with extreme growth now will they be glacially slow to grow. The RHS thought the Oullins Gage tree to be so good that they gave it an award. The juicy bit you bite into, also called the flesh, is semi transparent. Not enough to attach wire to and make yourself some DIY Gage spectacles but enough to let some light through. You can pick these fruits early and also use them for cooking. Self-fertile/Not self-fertile: This gage is self-fertile so there is no need for another gage for pollination. This gage is in flowering period is C4. This Gage will be suitable to act as a pollination partner for gages in the flowering periods C3, C4 and C5.